The unfortunate reality of language learning is that simply following an audio course or enrolling in an evening class will only help you scratch the surface of a language. The problem for most inexperienced language learners is that they don’t have an effective plan to help them reach fluency. Perhaps you’ve stumbled upon this page because you haven’t yet figured out how you’re going to tackle this problem. Maybe it’s the first time you’ve tried to teach yourself a new language… Maybe reaching fluency is taking longer than you expected. This project is all about taking the quickest route from zero to fluent. This is the obvious place to start, these are the fundamental tools allow you to go on to acquire the big picture. Although this step is pretty simple, it’s important to take it seriously, as any bad habits picked up at this point will be hard to shake further on. There a great number of resources and tools available to help you master these. Pronunciation – We need to learn both to recognise and also reproduce the range of sounds in the spoken language. Script – We need to learn the relationships between the sounds of the spoken language and the visual writing system. Some languages have an alphabet using characters to represent phonemes (e.g. English) and others use a logographic system which uses unique characters to represent entire words (e.g. Chinese). Many self-taught language learners begin learning a language with an audio course, hence this is the resource people typically use to learn the pronunciation and script. The biggest problem with this is that most courses will provide you with some samples of script and corresponding audio and expect that to be an effective enough resource to train your pronunciation with. Your ears at this point are not trained to hear the slight nuances that native speakers use and hence although you think you are pronouncing something correctly, many times you will you will be far from the correct form. Without feedback from a native speaker or a very detailed breakdown of all the phonetics being used, you are destined to start developing a poor accent. Pimsleur – This is a great course to start with, although I hold my reservations as to its effectiveness at more advanced levels of language learning. The good thing about this course is that for each new word that it introduces it breaks them down into each syllable and repeats them several times very slowly with both male and female native speakers to the point where you could not possible overlook a single phonetic. I honestly don’t know why more courses don’t do this. The main problem with using a language course to learn the pronunciation of a language however, is that you won’t be receiving any constructive feedback on your own execution. This is why I will always recommend.. Posting a recording online. Find a forum where native speakers are willing to help people learn their language. Reddit is great for this, for example if you wanted to get feedback on your French pronunciation www.reddit.com/r/french would be a great place to go. Offer conversational practice in your own language in exchange for native input on a website like www.sharedtalk.com. Ask an acquaintance who speaks the language natively to help you. When it comes to the apps that use your tablet or phone’s microphone to test if you’re repeating the phonetics perfectly (and there’s a lot of them), I advise you to stay well clear. The developers may have good intentions, but the reality is that this technology is wildly inaccurate at the moment. I would guess I’ve used 7-8 different applications so far and they’ve all been entirely useless. Learning the characters for languages such as Chinese or (partly) Japanese that employ logographic writing systems is something that can’t be mastered straight away as each of the many thousands of words has a different character. My advice is to learn the modern romanized alphabetic writing systems at first to facilitate to vocabulary acquisition and gradually learn the respective characters. Without a doubt the best way of memorizing each character for these languages is by using flashcards (physical or digital), a fantastic website for this is www.memrise.com. In terms of practicing the writing element of these languages, if you have a smart phone or tablet, I highly recommend searching for an interactive application that trains you to produce the strokes correctly, such as this one for Chinese on the Apple iOS. This is something you won’t be able to perfect at the beginning, rather it’s something you’re going to have to work on regularly throughout the learning process, especially when it comes to speaking with others. Stress, Rhythm & Intonation – These 3 things are collectively called ‘prosody’. Can you hear the speaker stressing and de-stressing certain words within sentences or syllables within words? Can you recognise the distinct musical flow to speech? Is the speaker varying the pitch of their voice at all? Prosody may demonstrate a variety of features of the speaker or the utterance: the nature of the utterance (statement, question, or command), the emotional state of the speaker, the use of irony or sarcasm, emphasis, contrast, and focus, or other elements of language that may not be encoded by grammar or choice of vocabulary. Speaking with a native-like ‘flow’ will make you sound really authentic and perhaps allow you to make deeper connections with other people as it allows you to express your emotions in ways which natives will better understand. Bonus Tip: Find audio of a native speaker of the language you are learning speaking your own language instead, with a very heavy accent, the heavier the better. The rhythm, intonation and stress (along with some phonetics) that they are applying when speaking your language will be carried over from their native tongue, there’s a lot to learn from this. Perhaps you can already do a great imitation of a native speaking your own language, great, you’re already more equipped than you thought. The International Phonetic Alphabet (IPA) – When I discovered the power of this tool, the way in which I studied pronunciation was changed forever. It’s an alphabetic system that maps every sound a human can make with their mouth to a specific character and so in theory it can be used to visually represent any word in any language. Even if you’ve never heard of the term IPA, you will have probably seen something in the dictionary that looks like this: “injustice [ɪnˈdʒʌstɪs]”. Each character in ɪnˈdʒʌstɪs represents a different phonetic, and if you have already learned how to pronounce each of them then you’re equipped to pronounce the entire word. To help my readers to start using the IPA in their studies, I’ve made the following interactive pages for; French pronunciation, German pronunciation, Italian pronunciation and Spanish pronunciation. Even if you are not learning one of these 4 popular languages, you can take inspiration from these pages on how to gather your own resources. Each page displays all of the IPA phonetics used within the language, examples words containing the phonetics, a spoken audio sample of the aforementioned examples and a demonstration of where they might also appear in the English language. Another great resource is this interactive application produced by the linguistic department of the university of Victoria which demonstrates each IPA phonetic voiced individually. Now I know this chart may look very intimidating, but remember you only have to learn just a fraction of these phonetics, just the ones relative to the language that you are studying. www.forvo.com is ‘the largest pronunciation guide in the world’. It’s a huge website hosting audio recordings for almost every word in almost every language imaginable, all crowd-sourced from their dedicated community. If a word is not already in the database, you can add a request for it to be recorded by a community member. With each recording you are given the extra handy information of the gender of the recorder and the regional dialect/accent that they speak with. www.rhinospike.com is a website where you can request a chunk of text to be recorded by a native speaker. By submitting recordings in your own language you can bump your requests up the queue. This is a great tool to clear up any doubts you may have as to how something is pronounced or to create your own listening exercises. Add an extra input language for your keyboard in Windows, you can switch between languages instantly with ‘alt+shift’. Find the alt-codes for accented letters for Windows keyboard inputs. Essential for European languages. The 250 most frequent words of a language are those without which you cannot construct any sentence. The 750 most frequent words constitute those that are used every single day by every person who speaks the language. The 2000 most frequent words constitute those that should enable you to express everything you could possibly want to say, albeit often by awkwardly. The 5000 most frequent words constitute the active vocabulary of native speakers without higher education. The 10,000 most frequent words constitute the active vocabulary of native speakers with higher education. The 20,000 most frequent words constitute what you need to recognize passively in order to read, understand, and enjoy a work of literature such as a novel by a notable author. (Nb. 1 Word =1 Head Word, conjugations not counted). Studying the first 1000 most frequently used words in the language will familiarize you with 76.0% of all vocabulary in non-fiction literature, 79.6% of all vocabulary in fiction literature, and 87.8% of vocabulary in oral speech. Studying the 2000 most frequently used words will familiarize you with 84% of vocabulary in non-fiction, 86.1% of vocabulary in fictional literature, and 92.7% of vocabulary in oral speech. And studying the 3000 most frequently used words will familiarize you with 88.2% of vocabulary in non-fiction, 89.6% of vocabulary in fiction, and 94.0% of vocabulary in oral speech. That’s right, studying the 2001-3000 most frequently used words will only allow you to be familiar with a further 1.3% of spoken language vocabulary! That’s not a (relatively) rewarding return on your investment of time in comparison to studying the first 2000 most frequent words. A graphical representation. 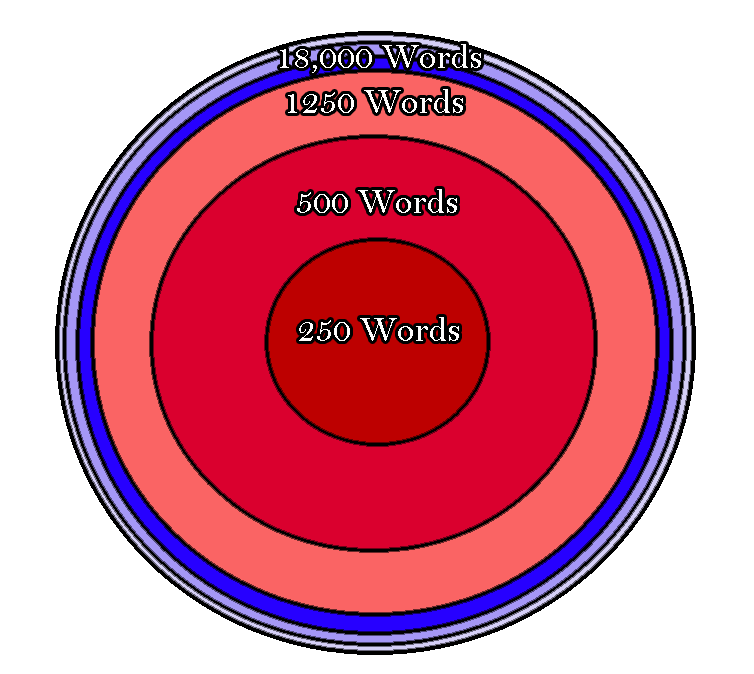 Red = the 2000 words covering 93% of the spoken language. Blue = 18,000 words covering just 7% of spoken the language. So what we can learn from this is that learning to use those first 2000 most frequent words is extremely important in our journey towards fluency and hence must be prioritized. This is not to say that vocabulary in the lower 10% frequency isn’t important to becoming being fluent, it’s just best that we focus on the highest frequency first so that we will get further in a language faster. One important point that I’d like to make absolutely clear before we go any further is that learning the core vocabulary of a language is not as simple as learning 2000 straight forward definitions. A major trait of the most commonly used words in any language is that a huge proportion of them will have multiple meanings depending on the context they’re being used in and belong to many commonly used collocations (strings of words such as idioms and phrases) which are essential to fluency. So our goal should be defined as learning the most essential uses of these 2000 words along with the important collocations that they belong to, which is obviously far more than 2000 pieces of information. Which Resources Are Best For Quickly Learning The Core 2000 Words? Well firstly, research has shown that the best style of learning for each individual is dependent on neurological factors. That is is to say, being hard-wired to be a visual, auditory or kinaesthetic learner influences which education techniques are best for you, but that’s a whole other blog post. For many people it won’t be immediately obvious which type of learner they are, it’s even possible you respond well to multiple styles. Through experimenting with all formats of education you should be able to gauge which works best for you. What are proven to work for almost everyone however, are mixed-modality language learning resources. Mixed-modality language learning resources are resources which use multiple formats to teach you the target content. These are a surefire way to access the language in a style that will work for you and help you to figure out how best you learn. These are very useful for people that can’t really figure out how they best learn. There’s a good reason why many of the most famous language courses use many different formats to educate the student. Demonstrates how to use a word as part of a sentence in writing. Explains and demonstrates how to use a word on an audio track. Challenges you to build an alternative sentence with your own initiative, speaking out aloud (activating your vocabulary). And then finishes with a challenging game/activity. (Although this is less common to find). That’s 4 different ways of teaching you 1 piece of information. The Michel Thomas Method My absolute favorite language learning resource! +Focuses well on the all important high frequency vocabulary, introducing them gradually in a very logical steps. +Makes the grammatical aspect of language learning seem very simple. +Prompts you to create sentences with all the new vocabulary, great for deepening your understanding of their function and activating passive knowledge. -Sometimes criticized for speaking both English and the target language with a poor accent. +Generally focuses on realistic high frequency conversational vocabulary. +Exposes you to vast array of native accents. +Tests you at the end of each chapter. +Each book provides you will a vast amount of learning material which will keep you busy for a long time. +Exposes you to many common idioms and slangs that you won’t find in other courses. -Can sometimes stray away from high frequency vocabulary. -Some Assimil courses being sold are several decades old and use out-dated vocabulary. +Useful exercises at the end of each chapter. +Focuses on realistic high frequency conversational vocabulary. -Too much white-space and too many illustrations. Not enough audio content either, less than 20 conversations per book. Overall less content than you would expect for the size of the book and the price. +/-Grammar explanation is thorough but sometimes over-complicated. Duolingo It’s mixed-modality but extremely flawed. -Does not focus on useful high frequency conversational vocabulary. -The voice in the audio is robotic and unrealistic. -Does not encourage you to create your own sentences or speak aloud. -The focus is on winning the game rather than deepening your understanding. -The explanation of Grammar is lacking and when present, very poor. +Will make you very good at reading the language. -The course runs at an extremely slow pace, you won’t be getting anywhere fast. -Very biased towards visual learners’ needs. -The price is astronomical, and there isn’t enough content to justify it. -Exposes you to a tonne of useless vocabulary that is real waste of time learning. -Encourages you to learn 1:1 definitions of each word. +The audio tracks actually make for good listening practice. -Very biased towards auditory learners’ needs. -Many of the courses are not accompanied by booklets. +Encourages you to activate your vocabulary. +Sticks to high frequency conversational vocabulary. Being meticulous or even obsessive about learning grammar is the downfall of many language learners. Most successful polyglots take a more relaxed approach to it, only paying attention to the most essential grammar rules and focusing more on learning phrases and vocabulary. The most important grammar can usually be easily picked up by learning many phrases and spotting the patterns naturally, just as a child does when it learns its first language. Of course it does help to read an explanation of grammatical rules sometimes if it’s not obvious to you what the rule is. The fundamental grammatical aspects you need for speaking fluently and writing vary from language to language, but are generally along the lines of: syntax (word order), basic conjugations (especially tenses) and punctuation. You can still speak fluently and be well understood without having perfect grammar, you just have to lose your fear of making mistakes and guess if you’re not entirely certain. All languages have many ridiculous and sparsely used grammar ‘exceptions’ that are the bane of a language learner’s studies. Trying to memorize them is not worth it at this point. It’s best to revisit them when you’re trying to perfect the language. So you’ve been focusing on the core of the language and now you understand loads! Perhaps you’re feeling pretty invincible right now and so you feel brave enough to strike up a conversation with a native, why don’t you tell them how passionate you are about collecting transistor radios and making ornamental bird baths. Darn! Your course didn’t teach you those words! Unfortunately, language courses aren’t designed with the intricacies of your life in mind. This is why you must evaluate your hobbies, interests and lifestyle and then hunt down the relevant vocabulary yourself so that you can use them in your own speech and identify them when exposed to them. I will google search for lists of phrases and vocabulary on the topics I am interested in. If I can’t find such resources, then I make my own. I spend timing making a lists of vocabulary in English that I would typically use when talking about a topic close to heart, then seek help from a native to translate them accurately and authentically. Flash cards and Anki spaced repetition decks will help you remember these more obscure words and phrases. You could passively know every word in the language (that’s to say you could understand the word if you saw or heard it) and still not reach conversational fluency, because you need the practice of using it. As Boris Shekhtman’s book “How to Improve Your Foreign Language Immediately” taught me, the biggest key to become fluent in a language is activating your vocabulary. Unless you get the practice in, you’ll be a stop-start wreck, constantly pausing to apply grammar rules and racking your brains to recall the perfect vocabulary. It turns out that when we speak a language fluently, we are generally not applying grammar rules or thinking about individual words at all, in fact we are reproducing ‘collocations ‘ (strings of words) cemented in our brains from past use. Also, when encountering words for the first time in a social situation we are far more likely to remember them long term. It seems when there are emotions attached to information, the brain values that information far higher than if we were learning from a book or a screen. Foreign-owned restaurants, stores and bars. It’s the practice that will make communicating second-nature, and with it you’ll soon be a smooth-talking language machine! Being familiar with how the English vocabulary in these sources would typically look makes it far easier to guess translations. Also the context of a sentence you understand every other word of with make vocabulary more obvious. Firstly I will get hold of a foundation Pimsleur CD for the language and learn the most basic words and phrases, but mainly for the reason of learning the phoentics of the language. Then I will drill myself with an IPA table, making sure I can pronounce every example word on the table and understand how the script relates to the sounds. After I’m confident with script and phoentics I will get hold of the relevant Michel Thomas course and run through it meticulously from beginner to advanced plus vocabulary builder. Several times a day I will test myself from the English in the booklets with the challenge of forming the sentences into the target language. When I’m confidently producing all of these sentences from the Michel Thomas Series, I will then accumulate large lists of vocabulary relevant to my interests and lifestyle. This is largely based around the topics of: work/business, sports/fitness, music, video games, football, family/friends, eating out, studying and travel. I use flash cards to memorize these vocabularies and also try build my own sentences with each of them, incorporating them with the core language learned from Michel Thomas. Also at this point I will start learning a lot of connector phrases (using flash cards also) that reflect the way I would speak in English. E.g. Phrases such as “In my honest opinion”, “as far as I know” and “If it were up to me”. After all this I’m becoming really quite proficient with the language, but from here on the name of the game is practice. Every opportunity to speak with a native should be taken, immerse yourself if you can, this is where we can truly reach conversational fluency. I take notes when I find gaps in my knowledge or mistakes, and just keep practicing henceforth. When I can’t find opportunities to speak to natives, I will watch a lot of YouTube videos with annotations in both English and my target language and practice listening comprehension, only toggling on annotations if I can’t understand something. I particularly like to listen to tedx talks, because there are very accurate captions and translations available, the speakers speak very clearly and there are very interesting topics to learn about. What do you mean by ‘fluency’? I define fluency as being ‘able to comfortably converse in all social situations you would typically expect to find yourself in when using the language’. I think it’s silly to hold yourself to native-levels of vocabulary and grammatical mastery before you call yourself fluent. How long will it take me to learn a language with this strategy? When answering this question, there are a couple of factors to consider..
Firstly, it depends on how many hours a day/week you put in. People who learn languages at school or with a tutor over a 7 year period for 1 hour per week are spending as much time with the language as someone that studies 8 hours a day for just 5 weeks and hence should expect to see similar results. Secondly, it depends on how distant the language is away from your native language or a language that you already speak. For a person that only speaks English, it will take a lot less time to learn closer languages such as French or German than it will to learn exotic languages such as Korean or Finnish. For me personally, it took me almost 3 years (at perhaps an average of hour a day, so over ~1100 hours in total) to reach fluency in French (my first language learning experience). Yet after learning from my mistakes, educating myself on language acquisition, and employing a bit more dedication (moving up to 3 hours a day) and strategizing I was able to learn German to conversational fluency in 7 months and then Spanish in just 6 months. I know that the first exotic language that I attempt to learn to fluency will take much longer however because I will have so much less inherited passive vocabulary and the grammar will be completely alien.